I'm left to wonder whether... manageability (and hence protection of the value of ITIL certification, whatever is left) wouldn't be better served by an expansion of the existing Institutes rather than an increasing number of independent bodies and systems to be policed. Especially as ITIL extends its tendrils into some of the murkier corners of the world. who happen to own Peoplecert, the APMG accredited EI. Of course the reason I'm so mad about it is because they appear to have overlooked copying the IT Skeptic. Peoplecert seem unaware that copying the entire content (and graphics) of somebody else's article is not OK just because you put a link to it at the bottom (which they don't always do either). Even if they acknowledged the copyright - which they don't - it STILL wouldn't be OK [to reproduce an entire article] without permission. If there is a copyright statement on the original - which there was on some - then without permission it's theft. If there wasn't, then it is unethical and lazy. in fact there doesn't appear to be a shred of original content on the entire site. talk about value-add (not to mention a clear lack of in-house ITIL thought leadership). And as an accredited EI I suppose they are allowed to use the Swirl as their twitter picture. We'll see. What a shame to see an accredited ITIL Examination institute trampling all over the intellectual property of others. 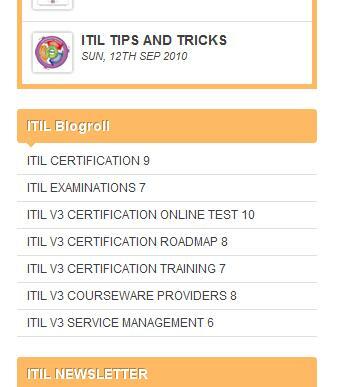 Somebody please educate the accreditors of the ITIL training industry on how copyright works. After this post went out yesterday, suddenlly all the ripped-off sites appear on the "blogroll". As if that makes it alright. Perhaps it would be better described as an "other-people's-work in progress". You've jump started alright, by jumping on the backs of others. Given the heavy letters that TSO send out to anyone who encroaches on your intellectual-property-based business monopoly, it is a bit rich when you leverage everyone else's hard work to build a commercial site that has so far contributed precisely nothing to the ITIL community. This is either legal or moral copyright infringement. EIs have to do better than this if the community is going to tolerate your stranglehold on ITIL intellectual property. Your only honourable course of action is to take down any content you don't have permission to use, and to properly attribute that which you do have permission for. Posts in ITIL-ITSM-PEOPLECERT blog are made according to original post owner's copyright and intellectual property directives. If you think there is a violation or an infringement please contact abuse@itil-itsm-peoplecert.com, so that post is either corrected or removed, copyright notice is added and industry trademarks respected. For pity's sake people! This isn't difficult. if somebody asserts copyright on their material, YOU MAY NOT COPY IT ALL, only a proportion limited by "reasonable use". It doesn't matter if you say who you nicked it from. And it is not up to them to complain if they want you to stop. YOU CAN'T DO IT. And even if they don't assert copyright, basic web etiquette says you don't copy it all. You quote some, you make comment, you link to the rest. How dense can you be? People don't post content for your convenience and for you to take the credit. They post because they want people to read it on their site. It is all about traffic and kudos. Courtesy says you should encourage their traffic not steal it. [27/10/10: One by one the copied posts are being replaced by the first third of the post followed by a link to the original - but not all of them! Peopelcert seem to have a policy of only fixing it if the owner complains. No value add. Nothing original to say. No indication of any knowledge of ITSM at all, let alone thought leadership. Not even an opinion on the original post. Just a mashup of the first bit. But at least the principle of fair use is being broadly followed and the original source acknowledged. 1) if APMG "work closely with our accredited organizations to ensure that services are delivered consistently, professionally, competitively and to a constantly high standard" clearly they didn't work closely enough with Peoplecert. I raised the issue initially of whether APMG could cope with an ever-increasing number of EIs to govern and whether they should be accrediting EIs in "murkier" parts of the world. Does this blatant abuse of intellectual property by an accredited EI point to APMG's inability to cope with the burgeoning ITIL industry? Submitted by skeptic on Tue, 2010-10-26 20:34. One by one the copied posts are being replaced by the first third of the post followed by a link to the original. 2) Given Peoplecert's contempt of other people's intellectual property, I wonder where their courseware comes from? Submitted by Matthew (not verified) on Thu, 2010-10-28 09:16. Actually I don't think the principle of fair use is being followed. My understanding of Fair Use, from publishing industry guidelines is that fair use allows for the copying of small amounts of material 'for the purpose of criticism or review'. Just copying a bit of a blog post and directing people to the original source is hardly 'criticism or review'. Submitted by skeptic on Thu, 2010-10-28 19:05. Submitted by Nikos Vasilakos (not verified) on Fri, 2010-10-22 05:54. Hi, thanks for taking the time reviewing Peoplecert new external corporate blog http://www.itil-itsm-peoplecert.com. This blog has just jump started (October 2010), so as it's a work in progress all issues will be resolved and addressed properly. Submitted by vinodka on Mon, 2010-10-25 05:14. An organization (that too an accredited EI) - should not have chosen to 'jump start' and 'progress' by using other's contents. I was unpleasantly surprised to see my blog contents copied word-by-word. Now, we see some disclaimer posted on your site regarding the content belonging to original authors. That is not enough, if you want to respect the copyright of the original authors. Copying ENTIRE CONTENT and posting it as if your blog post is not acceptable. You can review other's contents and refer to the original posts if you wish. You can even put a portion of the blog in your site with link to the original post for further reading. Since you have given an email ID to report (as an aftertought in your 'work in progress') - I have sent a separate, formal mail on to that. Submitted by Nikos Vasilakos (not verified) on Tue, 2010-10-26 10:41. I personally reviewed and fulfilled your requests, one hour approx. after you posted them yesterday. Feel free to check them yourself. Submitted by ServiceSphere on Tue, 2010-10-26 14:30. I represent the ServiceSphere organization. I can understand your need to have content on your site. It is tough in these times to jump start your business. Unfortunately you did not ask permission for any of the videos, articles or podcast that you are showing on your site from us. We wish to have all of our content removed immediately. This includes the blog roll. Finally your use of our IP in your multiple Facebook fanpages without credit of any type is not only illegal but I find it to be deplorable. I have contacted Facebook and filed IP infringements against your fanpages. In 72 hours we will "Jump Start" legal process. Submitted by Nikos Vasilakos (not verified) on Fri, 2010-10-29 17:15. All links to ServiceSphere were safely removed. Blogroll ServiceSphere link removed as well. Submitted by skeptic on Fri, 2010-10-22 20:09. I didn't review it - it was drawn to my attention by one of your irate victims. Perhaps it would be better described as an "other-people's-work in progress". You've jump started alright, by jumping on the backs of others. Submitted by skeptic on Thu, 2010-10-21 19:12. Submitted by skeptic on Wed, 2010-10-20 22:39. Finding the perfect gift for techies is no easy matter. After all, by definition, geeks are steeped in the latest and greatest tech gadgets, and it's just as difficult to find a tech-based subject they don't already think they know everything about. To help you find the perfect gift for the techie in your life -- or to steer a loved one toward something you'd really like - Acend has uncovered 10 seriously cool new gadgets that will appeal to the geek in all of us. Finding the perfect gift for techies is no easy matter. After all, by definition, geeks are steeped in the latest and greatest of tech gadgets, and it's just as difficult to find a tech-based subject they don’t already think they know everything about. To help you find the perfect gift for the techie in your life -- or to steer a loved one toward something you'd really like -- InfoWorld.com has looked beyond the obvious to uncover 10 seriously cool new gadgets and 24 must-read tech books that will appeal to the geek in all of us. Submitted by Visitor (not verified) on Wed, 2010-10-20 21:43. They were probably too afraid of copying from your site.... They also didn't copy (according to your list that is) from the ITS Portal, another original content site. Submitted by skeptic on Wed, 2010-10-20 21:52. I doubt they were that careful. This is a product of sloppiness and ignorance, not guile. it's forgivable to some extent in a newbie personal blog. it's not forgivable in an EI, who are themselves accreditation agents. Submitted by skeptic on Wed, 2010-10-20 21:33.